Best view at The Landing! New owners with great introductory rates. New owners, same location on this beautiful 2 bed \ 2 bath unit at The Landing. Previous owners had 133 Five Star Reviews and we plan to do the same! 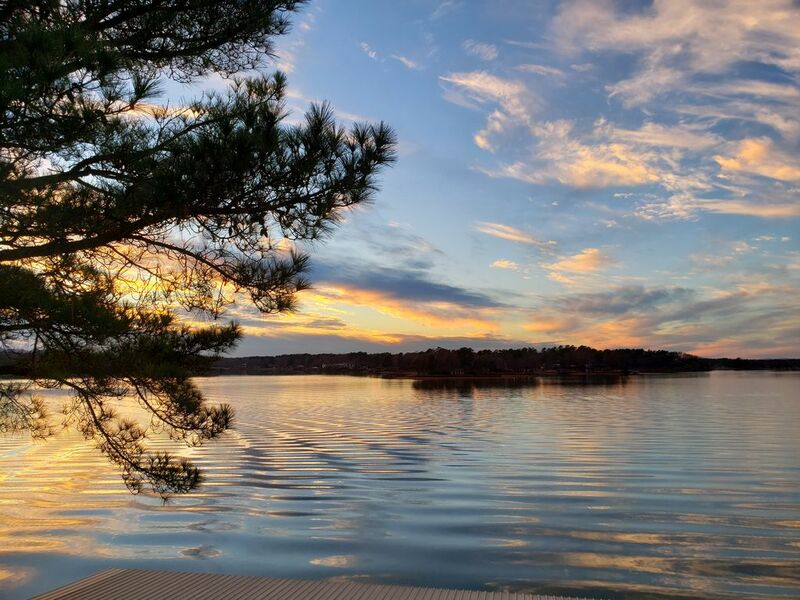 Enjoy morning coffee, sunsets and cocktails from your covered patio with spectacular main channel views of Lake Hamilton. Take 12 steps up from parking lot (with a landing after 6 steps) to front door for top floor quiet and peaceful overlook of Lake Hamilton. Your covered boat slip is directly below your balcony and just steps away. Take advantage of a front row seat for the fireworks display from the condominium community pier. Inside, relax with flat screen televisions and DirectTV in the living room and both bedrooms. BlueRay DVR in living room. Free internet provided by the Property Owners Association. Master bedroom has balcony and lake view, bath has walk-in tiled shower. Queen sofa bed in living room for guests or kids. Condo has a great location and is in a gated community. Boat slip included with rental. I am from Hot Springs and Danny is pure Cajun (and I'm a converted Cajun). We live in Lafayette, Louisiana and love both cities. I still have family in Hot Springs and we love to visit this great place when time allows. We had rented condos at The Landing before so when this unit became available, we jumped. It is in the westernmost building on the waterfront at The Landing and has the best unobstructed views, bar none. The boat stall is right in front of the building. We could not be happier with this unit and are excited to share it with our VRBO guests. We fell in love with the unit's balcony and fabulous views of Lake Hamilton. And, we love that the unit's kitchen and bathroom upgrades are fantastic. Our kitchen is wide open with plenty of space. We'll be changing out a few items to make it our own, but you can't beat 'life on the lake' here at The Landing. Stacked washer and dryer..220. Laundry detergent is provided. Plenty of towels and extra towels. Need to sit on balcony and catch the views! The condo is on 2nd level from parking lot. Six steps, landing,six steps to front door. The 1st level is down from the parking lot. The condo is in the best location--just off of Central and a perfect view of Hamilton. It was cozy and comfortable and very nicely decorated. Thanks for an awesome weekend. We had a great stay. The condo is very nice and has a well stocked kitchen. The condo also has a showstopper view of Lake Hamilton from both the living room and the master bedroom. The furniture on the balcony is very comfortable, and we really enjoyed sitting out there and enjoying the view. Our kids loved fishing from the dock. There are boat rental places in the immediate vicinity should you want to rent a boat. The condo has a nice, covered boat slip assigned to it. We would love to go back again sometime. Thank you for the review! So glad you enjoyed your stay. Hope you return soon! The unit is very spacious and decorated well. The view of the lake is beautiful from the balcony. We would stay again. Quiet and peaceful condo property. Located right off Central Avenue with several restaurants nearby. You cannot beat the view. Condo had everything we needed and more. Super clean, well decorated and perfect view of the lake. Hope to come back later this year. Thank you for the review. So glad you enjoyed the condo, and are welcome back. Great gathering spot for a quick weekend family rendezvous . Appreciate the owners accomodating a small canine family member too . Glad you enjoyed the condo. Hope you will return soon! Head downtown to some of the cool shops or go digging for Crystals at one of the Coleman mines. Garvan Woodland Gardens seems to be the one attraction not to miss. Mountain Biking....check out the new Northwoods Trailhead. Three skill levels of groomed trails!. For the kids, there's always Magic Springs and Crystal Falls theme park. Oaklawn is kicking off a whole hew era so check for news on Oaklawn Park.